Kimono’s and jackets have been very popular for me this season. I love that I can order my normal size and it will fit now and after I have the baby. I hate to purchase maternity clothes this far in my pregnancy because I only have one month left and that would be a waste. 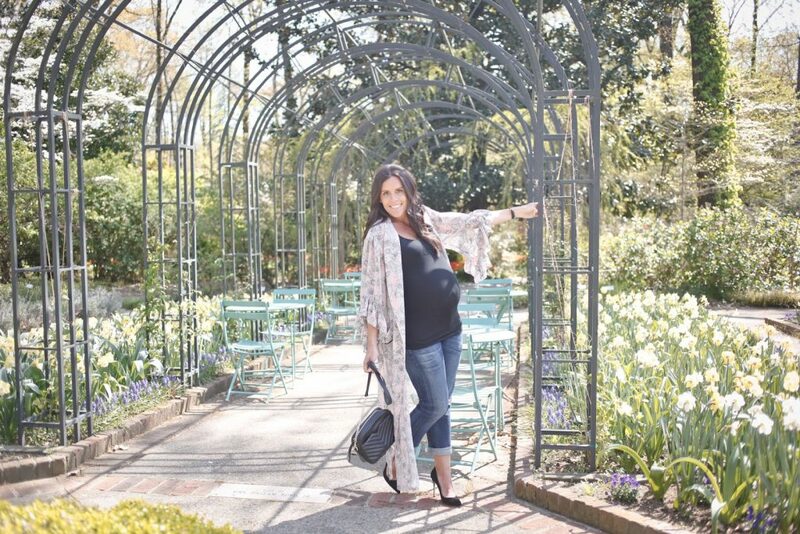 Therefore, I am repeating my maternity jeans over and over, wearing stretchy tanks and dresses and throwing on a blazer or kimono to pull the look together. If it ever gets warm enough I’ll wear my stretchy maxi dresses! 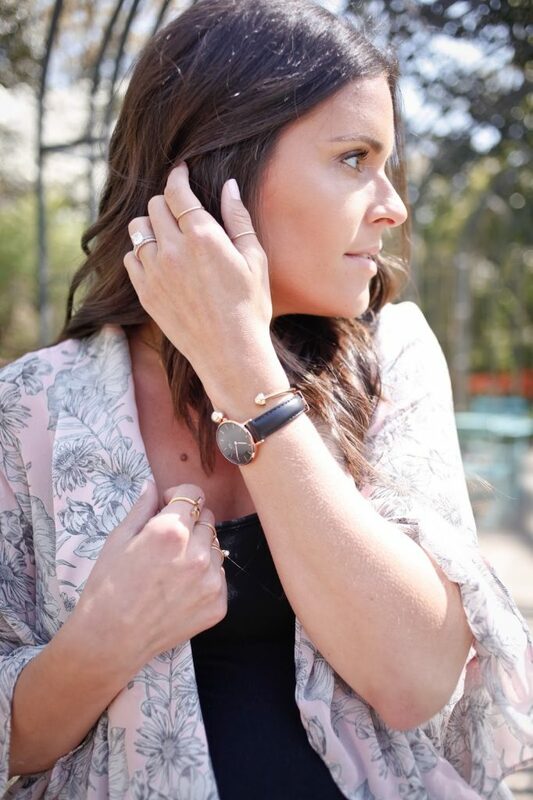 You can get 15% off a Daniel Wellington watch using code LIVINGLEREVE. My favorite look for less bag (under $50) is now available in red, pink and gray. 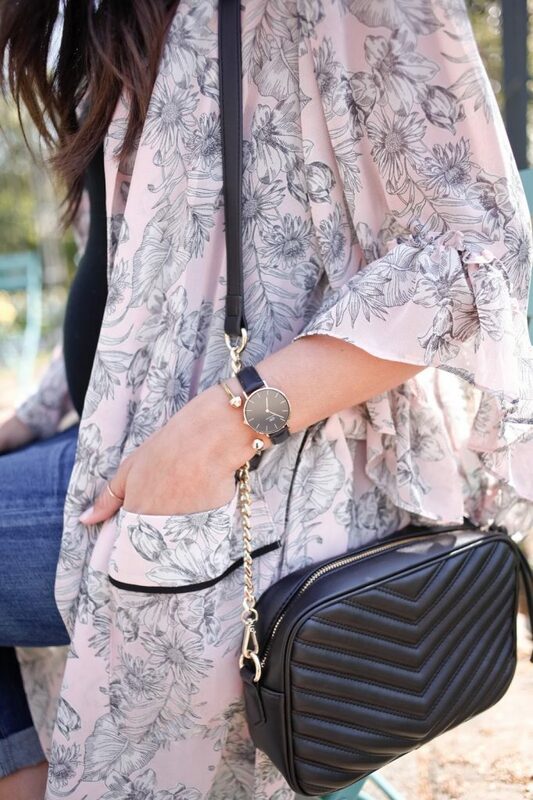 This kimono can be styled in so many different ways. I chose a lot of dark accessories which isn’t very spring like but takes on a more classy vibe. This kimono can definitely be worn with cut off shorts, a white tee and flats or sneakers for a causal take. The tank I am wearing is a maternity tank from H&M that I order early on in my pregnancy, my jeans are also maternity and I just got them! Citizens of humanity was kind enough to send me a pair of their maternity jeans. You know I love my Target maternity jeans but having a better quality designer denim is really nice, I have to admit. This pair has elastic panel inserts at the waist and a straight leg. I needed to cuff them, like I do most of my jeans, but they fit like a glove and I ordered my normal denim size. I found a pretty similar look for less here and it’s under $30!